One sign of a good musical is when the audience leaves the theater singing, humming, and whistling the songs from the show* which they've never heard before. Such was the case when I attended** the new, original, and very Minnesotan musical Deal! The Musical by Tyrol Hills Music. Not only are the songs catchy and hummable, but the story is heart-warming and wickedly funny, and it rings true to anyone who grew up in this state. It's a little like a Garrison Keillor story come to life, and in my opinion Garrison Keillor is an American treasure, so that's a very good thing. Deal! The Musical was written by local playwrights Jerry Seifert and Tom Broadbent, who also wrote the music. I gather from a note in the playbill, as well as the appearance of the name Broadbent in the real newspaper clippings that are displayed between scenes along with old photos, that this is at least a semi-autobiographical show for Tom. The story takes place over a ten-year span in the late 1950s and 1960s in the town of Stacy MN, not too far north of the Twin Cities on I35. Art and Elsie have just moved into town, having hit a snag in their dream to own their own farm. Elsie's newly widowed friend Pearl along with Art's brother Oscar and his "pal" Millie come over to the house to play poker every week, where much is discussed. Art and Elsie's two daughters grow up over the course of the play - from proms and first loves to babies and illness. Life changes and grows, and the only thing that stays the same is the weekly poker game that brings this family together. This capable cast (directed by Josh Campbell) is led by real life husband and wife team Jon Hegge and Laurie Flanigan-Hegge as Art and Elsie. Laurie has a beautiful voice that's featured in several songs, and Jon gives a nuanced performance as the head of the family who's struggling with not being able to provide as he had hoped, especially after an accident leaves him unable to work. He sings about feeling useless, and finding inspiration in his hero, Twins great Harmon Killebrew (as a lifelong Twins fan, any musical that includes a song called "Harmon Killebrew" is definitely one for me!). David Roberts' Oscar is a bit of a drunk and a loveable jerk, but we get to see a more vulnerable side when he sings about "The Lost and Found Tavern." Aly Westberg and Max Wojtanowicz share a couple of lovely duets as one of the daughters and her beau, who grow from an awkward prom couple to a married couple facing very real problems. The scene-stealer of the show is Kim Kivens (who was also great in Spelling Bee last fall) as the boozy, bawdy Millie, tottering on her high heels and constantly skiping off to the bathroom after uttering another cute euphemism ("time to tinkle!" "I feel a rain delay coming on!"). Millie's a cutesy, funny character, but Kim gives her depth (especially in the lovely "Lord's Prayer") and makes the audience root for her. Don't let the ads you might have seen fool you - Deal! The Musical is not a flashy Vegas musical; it's a sweet and funny Minnesota story about a family in a small town and people that will seem familiar to you. Yes, they cram a lot of hardships and romances into two and a half hours, so that some of them get short shrift, but that's forgivable when the overall show is this satisfying. Check it out at the Ritz Theater in Northeast Minneapolis (free parking across the street! ), and you'll see a lovely little story set in a small Minnesota town, where the women are strong, the men are good-looking, and the children are above average. 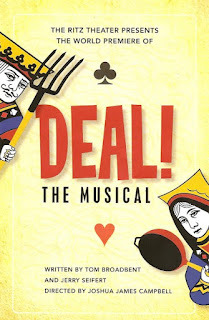 **I received one complementary ticket to see Deal! The Musical. i agree! well worth the time...you will leave singing and happy to be Minnesotan!